Here is another deal that caught my eye while I was playing with some computer software. What do you think of each of the calls in the auction? Against four spades, West leads a diamond. East wins with the ace and shifts to his trump. West takes the trick and returns a spade, East discarding a diamond. How should the play proceed from there? The first five calls of the auction were impeccable. Then we get to West's two-diamond raise. That was much too cautious. If West thought game was makable his way, he should have cue-bid two spades to show a maximum pass with diamond support. But if he judged game to be unlikely, he should have applied the Law of Total Tricks and jumped to four diamonds. With a combined 10-card fit, bid to the 10-trick level. 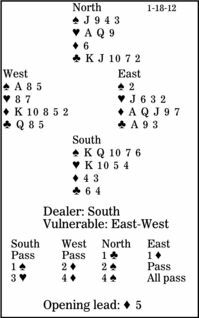 North had a comfortable two-and-a-half-spade rebid, but chose two spades because of his low point-count. Then South judged well to make a game-try. Now West showed the error of his earlier way. If he was willing to bid four diamonds, he should have done it immediately, not given his opponents a fielder's choice of doubling or bidding four spades. In four spades, declarer has to guess clubs. If the diamond ace is a true card, West is marked with the diamond king and has produced the spade ace; he cannot also have the club ace. So South should play a club to dummy's 10. True, East might have falsecarded at trick one, given dummy's singleton, but don't make a habit of assuming the defenders are being devious.